An intoxicated Chihuahua has added to the criminal troubles of its owner, according to Pennsylvania court records. Thomas Bloedel, 44, was arrested Thursday after he was found to be drunk behind the wheel of his 2014 Subaru Outback. 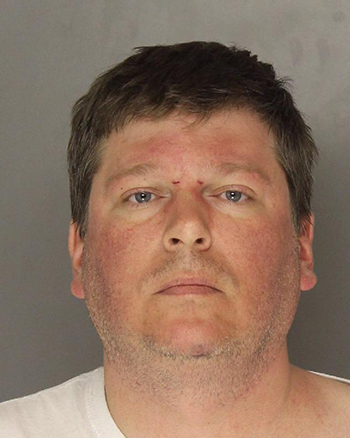 Bloedel slammed the SUV into a pole outside a suburban Pittsburgh home. Bloedel, cops say, was not alone at the time of the crash. The vehicle’s other occupant was Maxwell, Bloedel’s dog. And like his owner, Maxwell (pictured at right) was also plastered, according to a criminal complaint. 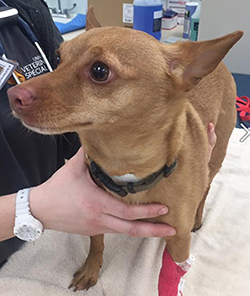 The Chihuahua was subsequently transported to a veterinary office, where staff noted that Maxwell's eyes were dilated and that the dog stumbled as he walked. Following treatment for alcohol poisoning (and an overnight stay at the vet’s office), Maxwell rallied. Bloedel, a Pittsburgh resident, was charged with DUI, animal cruelty, criminal mischief, careless driving, and making terroristic threats. The latter count stemmed from Bloedel allegedly threatening to kill various police officers. The criminal complaint notes that an “aggravated” Bloedel (seen at left) kept yelling “monkey dicks” and “similar nonsense phrases” while en route to jail.